A branch outing to Dundalk bay took place on Sunday 27th November. We met up at the Fairways hotel at midday and were joined by Breffni Martin of the Louth branch. Our first stop was near Lurgangreen where we spotted greylag, pink-footed and white fronted geese feeding in the fields. Flocks of lapwing and golden plover were also seen, with their plumage spectacularly illuminated by the bright sunlight. Next we visited Seabank where we picked up little egrets and a variety of roosting waders, before heading on to Annagassin and Salterstown. At Annagassin we stoped off at the harbour where we enjoyed views of turnstones, redshank, widgeon and a variety of gull species. Also present were flocks of linnets and greenfinches feeding on the weeds. 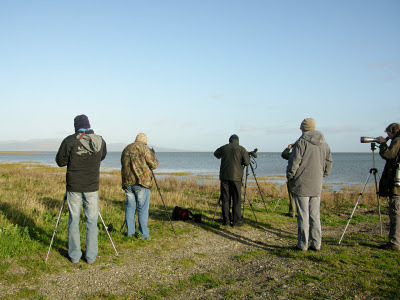 At Salterstown we got some good views of common scoters, divers and close-up views of some wader species. The highlight of the day was when we stopped off on our way home to observe the geese flocks once again. A tundra bean goose had been spotted earlier in the day feeding along with the greylags. Unfortunately we did not see the bean goose, but we thoroughly enjoyed the time we spent observing the flocks of brent, pink-footed, greylag and white-fronted geese feeding. A great finish to a great days birding! MARSH HARRIER SEEN FROM HIDE TODAY. A Midlands Birder - tales from the lakeshore and beyond !